Nidhogg II, from developer Messhof, is a sequel to the indie hit Nidhogg. Gameplay will be very familiar to those who enjoyed the original, but the art style has changed drastically, with stick figures and simple backgrounds replaced by the grotesque (and occasionally bright and cheerful) art of Toby Dixon. In addition, characters are now customizable, and there are more levels and several new weapons. 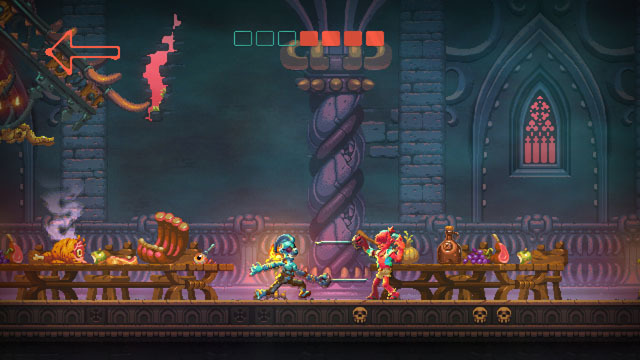 Instead of just fencing foils, players will find themselves wielding broadswords, daggers, and even bows and arrows, each of which requires different tactics. The game is just as fast as ever, with quick deaths, the ability to toss weapons, disarm foes, and engage in hand-to-hand combat, and huge sprays of blood when an enemy is defeated... only to respawn moments later. Fight your way to victory and demonstrate your worthiness of being devoured by the legendary Nidhogg. Or, set up an 8P tournament to do the same in an environment that allows the proper amount of yawping and cursing. The game is now available for PC and Mac via Steam, and PS4 via PSN. Check our coverage here.